NEW YORK (CNNMoney) -- Verizon Wireless' 4G network suffered its third nationwide outage in as many weeks on Wednesday, calling into question whether Verizon can continue to live up to its branding as "America's most reliable network." Irate customers without service took to forums once again, poking fun at Verizon's "Can you hear me now?" commercials and "It's the network" motto. Many complained that Verizon lacked transparency about what was going wrong and when the issue would be resolved. The company said in a terse statement that the issue was resolved overnight, and 3G data, calling and texting were uninterrupted during the 4G network's outage. Verizon's 4G phones can connect to the 3G network when 4G is unavailable. Verizon (VZ, Fortune 500) has built its brand on network reliability, and the company said its 4G-LTE network that launched late last year was built with "the same performance and reliability for which Verizon has long been recognized." The company said that its network was the most reliable because of "rigid engineering standards and a disciplined deployment approach year after year." But Verizon's 4G network has been anything but reliable. It has suffered four nationwide outages this year -- one in April, and now three in consecutive weeks. Meanwhile, the company has remained tight-lipped about the issue, saying it's "investigating customer complaints" when it goes down and declining to comment on what might be causing its network to fail. Though that's par for the course for wireless networks, it's also little source of comfort for customers. Making matters worse for Verizon and its customers is that wireless infrastructure experts expect this isn't the last time the 4G network will go down. Since Verizon was the first company in the world to deploy a 4G-LTE network at any great scale, it is dealing with the usual early-adopter growing pains. LTE is a much more intricate technology than its predecessors. Unlike previous systems that use switches to control traffic, 4G uses "cores," which act like large, centralized command-and-control centers. Switches covered city blocks, but 4G cores are now serving multiple states. If one goes out, entire regions could lose service. Next-generation networks are based end-to-end on Internet Protocol, which routes packets of information over the Internet rather through circuits. That makes 4G about 10 times faster and gives it significantly more capacity for data traffic than 3G, but it also brings a new host of issues to the table. Unlike older, circuit-based networks, which were inherently resilient, IP-based networks need to be engineered to be reliable. That's tricky to accomplish with a brand new technology at a scale that's never been tried before. Despite the frequent service interruptions and lack of transparency, some marketing experts believe that customers will give Verizon a pass -- not because they're pleased with their service, but because other options aren't necessarily any better -- or available. 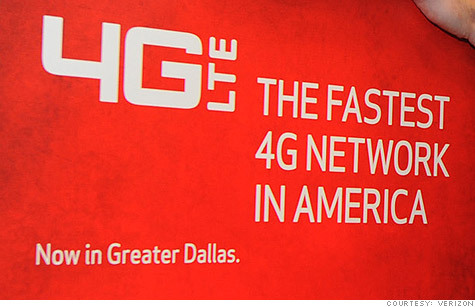 Verizon's 4G-LTE network covers 200 million Americans. AT&T's (T, Fortune 500) 4G-LTE network is in its infancy, covering just 70 million Americans. Sprint (S, Fortune 500) has a 4G network on a different network standard that covers about 120 million, and T-Mobile's "4G" network is really a 3G network. Customer satisfaction for all carriers fell this year, according to a survey conducted by Consumer Reports. And switching carriers can be a major hassle, particularly mid-contract, when customers are subject to sizable break-up fees. "Verizon's 'It's the network' motto isn't something that's really resonant with users, because there's a general resentment of wireless carriers," said Tom Dougherty, CEO of marketing firm Stealing Share. "Telephone companies have us locked in with lead handcuffs. We can't get out of the contracts we sign anyway, so Verizon's risk is really minimal here." There also simply aren't that many 4G customers for Verizon to lose. Verizon doesn't break out how many of its customers are using its 4G network, but Verizon has 91 million total retail customers, and the company has sold just 3.1 million 4G devices through September.